This new framework is intended to support the aspirations of all who work in the emerging professional area of researcher development. CFRD can be used in a number of different ways, and at different stages of a researcher development career. It can help to identify and assess the relevant knowledge, skills and expertise that you bring with you from previous roles, those that you need to develop now and those you wish to develop in the future. Interest in a framework to support the career development of researcher developers was first identified at the Vitae conference in 2011. ‘Researcher development’ was recognised as an emerging profession which could be distinguished from educational or broader staff development and included a rich mix of full and partial roles, varied responsibilities and staff at all levels. Delegates to the conference noted the irony of a situation where those who supported the professional development for others found little available specifically for them when thinking about their own professional development. In early 2012, a working group of over 30 researcher developers from across the UK was co-ordinated by Vitae to look at rectifying this situation and to support the professional aspirations of researcher developers as part of a variety of different career pathways. The group began by considering the Association of University Administrators (AUA) generic professional development framework and translating this, with AUA guidance, into the context of researcher development. The framework evolved from this through a process of iteration, feedback and review with large numbers of researcher developers across the UK. In producing this framework, the group cross-checked and mapped career pathways, career aspirations and the broad task landscape, and also examined bridges to other professional pathways and CPD frameworks. The term researcher developer includes all roles where provision of professional development for those who do research forms part or all of the role. may be responsible for researcher development as part of a wider role in the organisation. 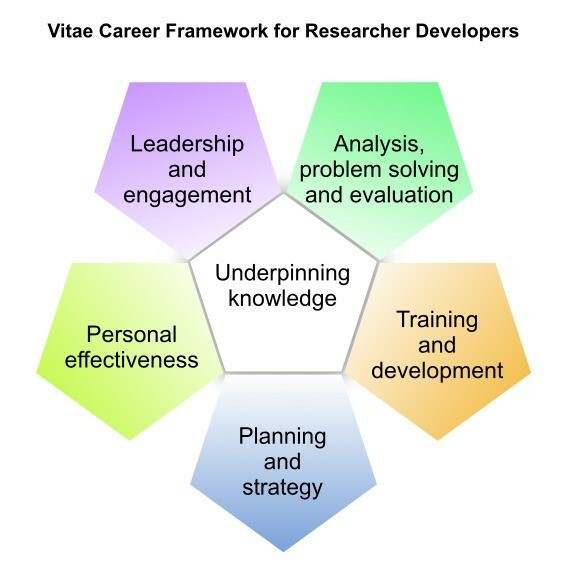 The Vitae Career Framework for Researcher Developers is designed to support the career development of researcher developers. Whether you are working in researcher development full-time, on secondment, or part-time within a broader role, using the Framework will help you to identify and articulate the knowledge and expertise you are acquiring. Take a look at the profiles of a range of people who work in researcher development. The Framework and associated resources will help you to plan and develop your career in this new area by helping you to gain greater insight into your own capabilities and opportunities in the context of your role in developing researchers. Each section is composed of a number of elements of expertise or knowledge which are associated with a role in researcher development. The elements are grouped under one of three career ‘stages’; these stages recognise that people with responsibility for different aspects of researcher development work at all levels in research organisations.